Krishna's Deity form is His physical likeness in the material world. Such forms are made of stone, metal, wood, paint, or other materials and are worshiped as Krishna Himself. Krishna is the Absolute Truth, the source of all things, including personality and form. His personal form is superior to all other forms. He is completely spiritual—permanent, all-knowing, and supremely joyful—and there's no difference between Krishna and his form. He appears in this world as the Deity—an apparently material form—because our materially covered senses can only perceive matter. We can't see spirit, but we can see and serve Krishna in His Deity form. The philosophy and practices of Deity worship are elaborately described in the Vedic writings. Krishna consciousness is a science of practical action. The goal isn't to stop acting but to fully engage in service to the Supreme Person. Deity worship allows us to associate with Krishna in a form we can see and touch. The process of Deity worship provides opportunities to bathe, dress, feed, and decorate Krishna, as well as entertain Him by singing and dancing, decorating the temple, and bringing others to see Him. The more we become involved in such service, the more tangible our relationship with Krishna becomes. Deities and paintings of Krishna are based on descriptions found in Vedic literature, which also explain in detail how to worship Them. Deity worship is distinct from idolatry, which is usually defined as worship of any cult image, idea, or object, as opposed to the worship of a personal form of God. God is omnipotent. All energies, material and spiritual, are completely under His control—He can turn matter into spirit and vice versa. Krishna is not wood or stone, but Krishna appears to us as stone or as wood to enable us to see and serve Him. Worshiping the Deity - a tangible way to serve God directly in our present material condition. - if God has a personal form, what is it? - How has a practice that once appeared so alien to the Judeo-Christian spirit attracted so many Westerners to embrace it themselves? - a collection of articles on the subject of Deities and Deity worship. "He [Krishna] accepts the form of archa-vigraha (worshipable Deity) just to accept service from His different incapable devotees. By the mercy of the archa-vigraha, the form of the Lord in material elements, the devotees who are in the material world can easily approach the Lord, although He is not conceivable by the material senses. The archa-vigraha is therefore an all-spiritual form of the Lord to be perceived by the material devotees; such an archa-vigraha of the Lord is never to be considered material. There is no difference between matter and spirit for the Lord, although there is a gulf of difference between the two in the case of the conditioned living being. For the Lord there is nothing but spiritual existence, and similarly there is nothing except spiritual existence for the pure devotee of the Lord in his intimate relation with the Lord." ". . . the common man . . . is advised herein to visit the temple of the Lord and bow down before the Deity, even though he may be a very rich man or even a king with a silk turban or crown. The Lord is the Lord of everyone, including the great kings and emperors, and men who are rich in the estimation of mundane people must therefore make it a point to visit the temple of Lord Sri Krishna and regularly bow down before the Deity. The Lord in the temple in the worshipable form is never to be considered to be made of stone or wood, for the Lord in His archa incarnation as the Deity in the temple shows immense favor to the fallen souls by His auspicious presence. . . The common man who is puffed up with his material position and does not bow down before the Deity of the Lord in the temple, or who defies temple worship without any knowledge of the science, must know that his so-called turban or crown will only succeed in further drowning him in the water of the ocean of material existence." "In the material world, the Lord is always worshiped as the archa-vigraha, or Deity in the temple. There is no difference between the archa-vigraha and the original person, and therefore those who are engaged in worshiping the Deity in the temple in full opulence, even on this planet, should be understood to be directly in touch with the Supreme Personality of Godhead without a doubt. As enjoined in the shastras (scriptures): "No one should treat the Deity in the temple as stone or metal, nor should one think that the spiritual master is an ordinary human being." One should strictly follow this shastric injunction and worship the Deity, the Supreme Personality of Godhead, without offenses. . . By avoiding offenses against the Deity and the spiritual master, one can advance in spiritual life, or Krishna consciousness." "When we worship the Deity of the Lord in the temple, the Deity appears to be stone or wood. Now, because the Supreme Lord does not have a material body, He is not stone or wood, yet stone and wood are not different from Him. Thus by worshiping stone or wood we get no result, but when the stone and wood are represented in the Lord's original form, by worshiping the Deity we get the desired result. This is supported by Sri Chaitanya Mahaprabhu's philosophy, acintya-bhedabheda, which explains how the Lord can present Himself everywhere and anywhere in a form of His energy to accept service from the devotee." "Various classes of devotees worship the Deity of the Personality of Godhead according to their various stages of faith in the Lord. An advanced devotee of Lord Krishna understands his eternal loving relationship with the Lord and, seeing the Deity as the Lord Himself, establishes an eternal relationship with the Deity based on loving servitude to Him. Understanding Lord Krishna to be the eternal form of bliss and knowledge, a faithful devotee makes a permanent arrangement for Deity worship, installing the Lord's form made of, for example, stone, wood or marble." ". . . worship of the Supreme Personality of Godhead in His form within the temple is not idol worship. There is evidence in the Vedic literature that worship may be saguna or nirguna—of the Supreme possessing or not possessing attributes. Worship of the Deity in the temple is saguna worship, for the Lord is represented by material qualities. But the form of the Lord, though represented by material qualities such as stone, wood or oil paint, is not actually material. That is the absolute nature of the Supreme Lord. A crude example may be given here. We may find some mailboxes on the street, and if we post our letters in those boxes, they will naturally go to their destination without difficulty. But any old box, or an imitation which we may find somewhere but which is not authorized by the post office, will not do the work. Similarly, God has an authorized representation in the Deity form, which is called archa-vigraha. This arca-vigraha is an incarnation of the Supreme Lord. God will accept service through that form. 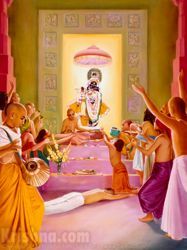 The Lord is omnipotent, all-powerful; therefore, by His incarnation as arca-vigraha He can accept the services of the devotee, just to make it convenient for the man in conditioned life." - see Deities and Deity worship going on live in temples around the world, in real time. We're looking for more audio and video on this topic. Want to help? If God is one, why are there often so many Deities in Krishna temples?